Despite finishing the 2017-18 season with a 4-8-5 record, the ARHS hockey team still has hopes for its future. The team has made their division’s playoffs in each of the last three years, but this season fell short of qualifying. Senior Dylan Walter, a varsity defenseman, attributes his team’s struggles to an unavoidable lack of experience. The players that had the most time on the ice were underclassmen. The team was also faced with the challenge of not having consistent student leadership on the roster. 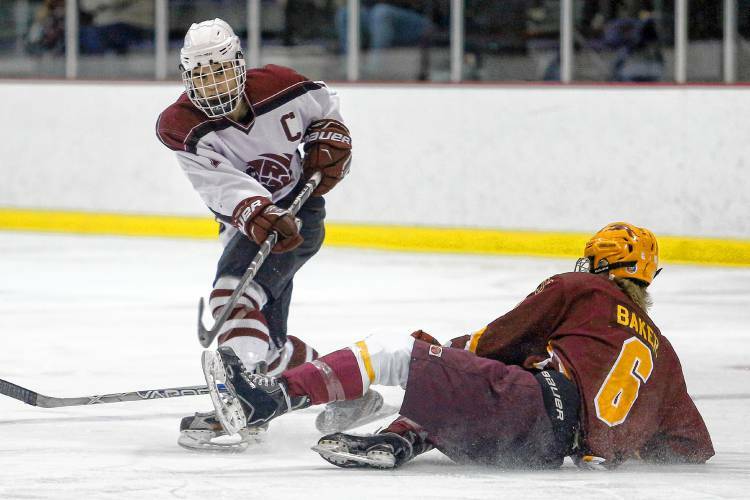 At the beginning of the season the team was captained by Nico Cardaropoli, a senior from Palmer. Cardaropoli was absent for the beginning of the season and, while he played a handful of games, was unavailable for the rest of the season. Head coach Mike Rousseau was not available to comment on the absence of this captain. Brandon Feldman played an important role in leading the team after Cardaropoli’s departure. Bradley Sherwood, a senior at ARHS, said the team “managed to dig ourselves out of a hole” and improved significantly after their game against Belchertown, as they tied Minnechaug and then went on to beat East Longmeadow, Drury, and Wacona. Sherwood noted that Feldman taking over the role of captain helped facilitate their four-game streak. However, the team fell short of qualifying for playoffs by one point. They failed to score against Chicopee and Greenfield in their last two games. The players also expressed their hopes for the future of Amherst’s hockey program. To them, the varsity team’s underclassmen and the junior varsity players have the opportunity to experience a lot of success. In fact, the team’s starting goalie was often an eighth grader. Sherwood believes that this past season’s shortcomings will not slow the team down.